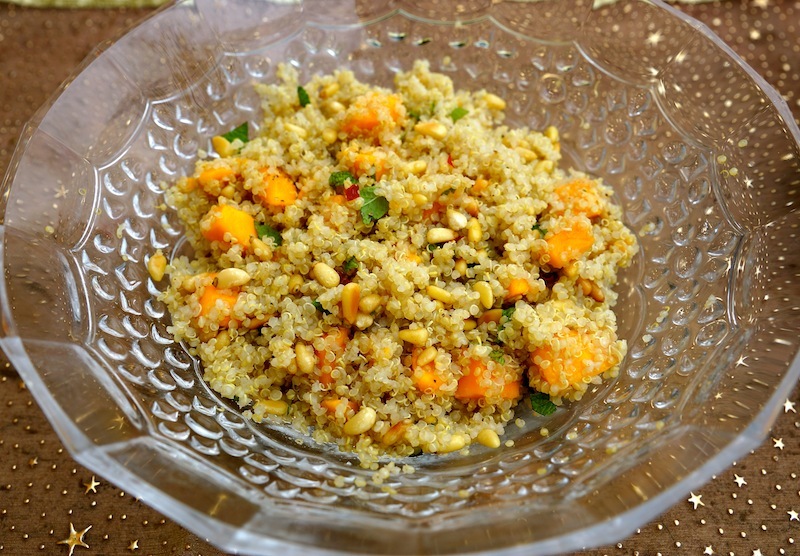 I’m a big fan of quinoa and I’m always trying to find new recipes that can highlight it. 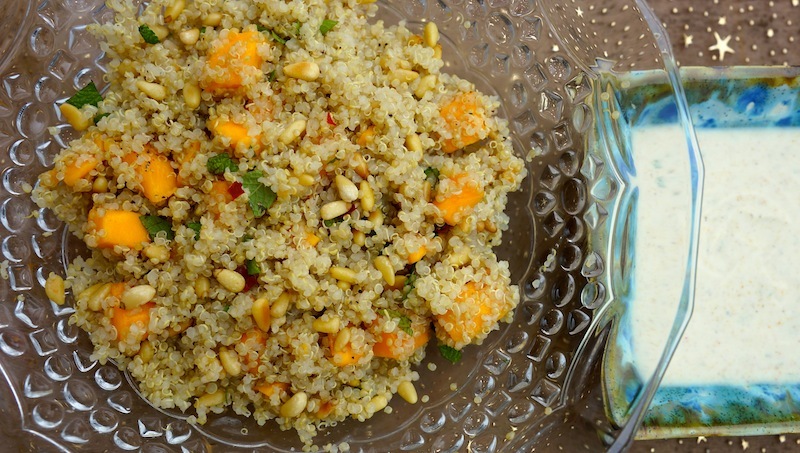 This great Quinoa Salad recipe with its original taste really highlights quinoa in a special way. In case you didn’t know, quinoa originated in the Andes region of Equador, Bolivia, Colombia and Peru. It was first domesticated 3000 years ago and for the Incas it was a sacred crop. Its popularity is now spread a bit all over the world, in particular in Europe, the US and Asia. It is mostly appreciated for its nutritional value as the protein content is very high. It is also a good source of dietary fiber, phosphorus, magnesium, iron and also calcium which makes it great for vegans and people who are lactose intolerant. This recipe was adapted from a Portuguese recipe of Mafalda Pinto Leite. I really love it, the sweetness of the mango combines ideally with the bite of the nuts and the spiciness of the chile. 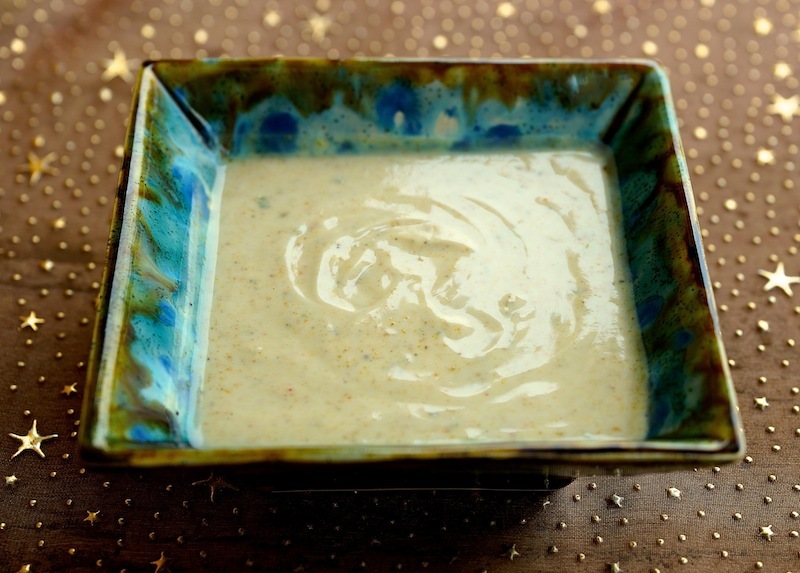 The yogurt sauce with the curry powder, ginger and the acidity of the lime, is perfectly balanced. I did not have Greek yogurt which is very difficult to find here in Mexico, so I used low fat plain yogurt and the result was very light, creamy and smooth but if you do have access to Greek yogurt you can tell me how it compares. I also did not have peanuts so I roasted pine nuts and used it instead. I thought it worked well with all the other ingredients and flavors. In a bowl mix the yogurt, the lime zest, lime juice, curry powder, salt and pepper to taste. Reserve. Rinse the quinoa very well and drain it. Bring a big pot of salted water to a boil, add the quinoa and let it cook for 15 minutes. Drain well and leave it to cool. Peel and cut the mangos into about 1 cm/1/2 inch cubes. Remove the seeds from the red chili and cut it into thin slices. Roast the peanuts. Mix all with the quinoa, except the yogurt sauce. Sprinkle with the chopped mint and cilantro. Taste and adjust the seasoning. Serve it at room temperature accompanied by the yogurt sauce.